"Granular Moon” is a work of dedication to explore ever-evolving sounds. One year in the making, it contains a huge number of atmospheres, pads, field recordings and an additional arp section. All atmospheres and pads are assigned to Mod Wheel and become pulsing sounds, fully editable, synced to your bpm, for the most flexible use as underscore textures. 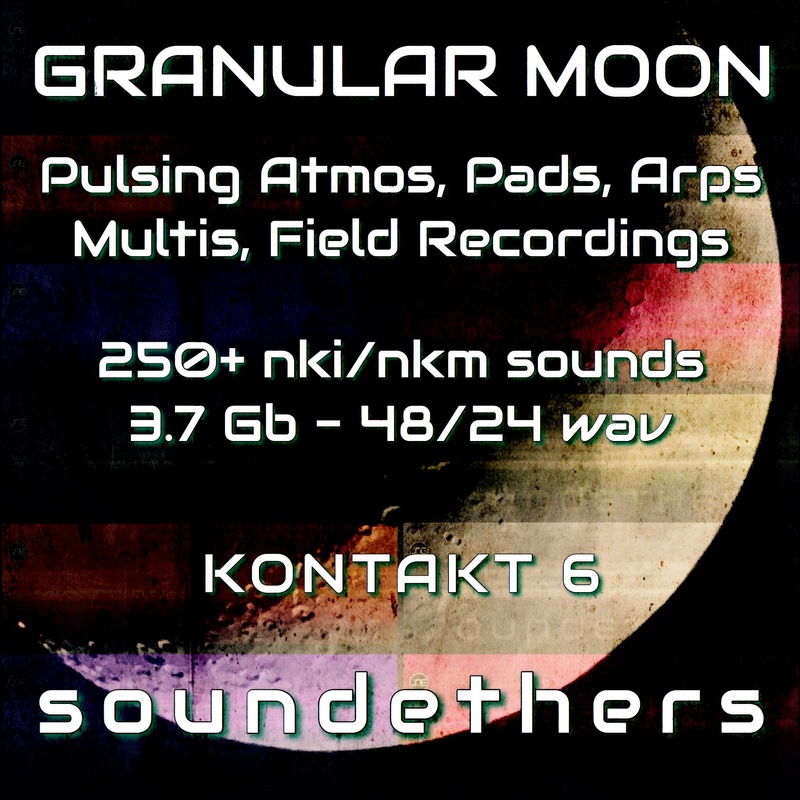 The real core of “Granular Moon” is the Multis folder, here you will find the whole potential of these evolving sounds. 127 original samples (3.73 Gb) delivered in wave 48hz/24bit, ready to use in your favorite DAW too. ATMOSPHERES (66) – evolving sounds with intervals - long samples (up to 4 minutes!!). FIELD LOOPS (28) – raw environments recorded at hi-res in different locations. MULTIS (91) – the real core folder of this library, explore it! PADS (30) – tonal playable sounds - analog sources processed with granular synthesis. ARPS (36) – additional unusual arps, made with the basic Kontakt arpeggiator script. FULL DETAILED MANUAL, with infos and screenshots! Read it and edit your sounds! The beautiful new "Replika Delay" of Kontakt 6 creates amazing spaces: it has been used in all Atmos and Pads. Enjoy it! Very long samples are used (up to 4 minutes) in all categories, so let the “Granular Moon” sounds evolve over time for best atmospheric results. Explore all the key range! INSTALL INSTRUCTIONS: due to the large size of the library, it has been split into smaller parts: download them all, place them in the same location and unzip (just click on granular_moon.zip). The resulting folder will contain the whole "Granular Moon". Place it in your HD preferred directory and you're done!